Evocative, traditional Russian Orthodox monasteries in the United States give visitors a taste of a more mystical life. Surrounded by modest single family homes in a quiet suburban neighborhood, the decorative onion dome roofs of St. Sabbas Orthodox Monastery spring out of the landscape, hinting at the transformative experience that lies beyond its gates. 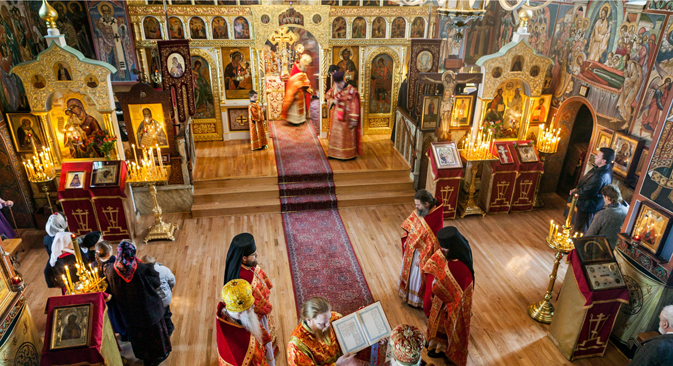 Visitors to the Russian monastery in this suburban Detroit neighborhood are treated to European cuisine while surrounded by exquisite gardens and the elaborate architectural elements common in Russian Orthodox churches. Twice a week, St. Sabbas, in Harper Woods, Michigan, opens up its grounds to the public, offering luncheon teas (on Tuesdays and Thursdays) and gourmet dinners (on Thursdays). The monastery, which was founded in 1999 and now occupies six acres, is home to four monks. It’s not uncommon to see one of them quietly walking between buildings on the grounds wearing a heavy black robe, even on a hot summer day. St. Sabbas (pronounced “Sava”) Monastery is one of only four monasteries in the United States that follow the traditional teachings of the Russian Orthodox Church Outside of Russia, (ROCOR), said St. Sabbas’ Abbott, Archimandrite Pachomy, who is also called Father Pachomy. St. Sabbas, the youngest of the four American monasteries, is a center for liturgical arts in conjunction with traditional monastic standards, says Father Pachomy, whose birth name was John Belkoff. The other three ROCOR monasteries are Holy Trinity Monastery, Jordanville, N.Y.; Holy Cross Monastery, Wayne, West Va., and Monastery of the Holy Cross, East Setauket, N.Y. The Russian Orthodox Church Outside of Russia was established after the Bolsheviks, who embraced state-sponsored atheism, came to power in Russia. in 1920, Russian Orthodox Patriarch Tikhon, who had previously served in North America and established the Diocese of the Aleutians and North America, issued a decree stating that all Russian Orthodox Christians abroad who were under his authority should govern themselves. In 1922, ROCOR was established in Serbia. The Jordanville, N.Y. monastery, the oldest and the largest of the U.S. ROCOR monasteries, dates back to 1930. It includes a publishing house, an icon-painting studio, a library, a Russian cemetery and a historical museum. Dozens of monks from all over the world work in the print shop, the bookbinding shop, the book store, the kitchen, the bakery, the icon-painting studio and icon-mounting studio. During the summer, the monks and seminarians also work the gardens, work the fields and tend to the cemetery. The Hermitage of the Holy Cross Monastery was founded in 1986 in House Springs, Mo. before moving to West Virginia in 2000. The 24 monks and candidates who live there support themselves by manufacturing handmade incense in the ancient Athonite tradition as well as through selling icons, homemade soap, and other liturgical items. The Monastery of the Holy Cross, East Setauket, N.Y. was founded in 1974. The nine monks there also make candles and incense to support themselves. About 8,000 people visit St. Sabbas each year to attend church services, eat in the restaurant or listen to a lecture about the history of the Russian Church. Father Pachomy began his training at Oakland University. From there his studies took him to St. Tikhon’s Orthodox Theological Seminary in Pennsylvania where he became a novice in the oldest American Orthodox Monastery and graduated in 1988. The Russian Orthodox Church in Detroit began in the early 1900s, but by the 1980s, Detroit’s hard times sent many parishioners to the suburbs and the original Russian cathedral, located in a rough neighborhood in the city, was closed. Father Pachomy moved to a house in a neighboring suburb with the hope of finding a place for a new parish, but instead ended up founding the monastery. The monastery is surrounded by beautiful gardens, fountains, and mosaic shrines, very much in the style of ancient monasteries. The elaborate public spaces do not extend to the simple quarters where the monks reside. They have no TV or radio and there is just a single computer on the property. The restaurant, the Royal Eagle, is a non-profit venture that helps fund the monastery. Reservations fill up a month in advance. Everything is prepared by chef Petr Balcarovsky, who studied culinary arts in Europe. The servers, who dress in traditional Russian attire, volunteer their time. The venture faced a major challenge nearly from the start, however, when the local health department required $80,000 worth of renovations to the brand-new kitchen, Father Pachomy says. Church patrons Mike and Marian Illitch (owners of Little Caesars Pizza, the Detroit Tigers and Detroit Red Wings) paid for the changes to the facility. The seven-course tea includes borscht and patrons are offered a choice of more than 40 loose-leaf teas, served by the pot to accompany canapé sandwiches, paprikash chicken skewers and desserts. The shop offers handcrafted gifts and music CDs, including one of the evening vespers service. Brother Romanos, who is a novice, is an accomplished musician. Shorts, tank tops, low cut shirts or dresses, cigarettes and chewing gum are forbidden. Women must wear head coverings inside the church during services. But these restrictions are not burdensome; most guests say the rules add to the charm. “It’s quite lovely here,” said Dawn Bresnahan, who visited the restaurant for tea with her Red Hat Society group on an early spring day. “Covering our heads isn’t a problem for our group,” she added, noting the hats they are famous for wearing. The monastery must rely on the restaurant and gift shop to fund the property, Father Pachomy said. “The church has to find a way to be more and more self-sufficient, and monasteries even more so,” he said.